My grandmother was nuts. We used to laugh at her seemingly endless and silly list of worries. Everything from having to eat lunch at precisely noon to taking a shower to something as simple as going to the bathroom would stress her out. She would share stories about her bowel movements with intense seriousness and gravity and it seemed her entire universe started and ended in the bathroom. Ironically, that’s where she ended up passing away. That’s right. On the royal throne. Jokes aside, what we should have known was that she suffered from something called anxiety disorder, which, unfortunately, is no laughing matter. When you think of an anxious person, you probably conjure a picture of someone whose legs are restless, forehead is beaded with sweat, hands are wringing, and possibly someone who stutters. But anxiety is actually a lot more than just that, and maybe even a little different. Affecting nearly 14 million people in the U.S. alone, anxiety disorder is one of the most common types of mental illness in the U.S., but many people don’t even know they have it. Have you ever had to prepare for a huge deadline? Or present something in front of a large audience? It’s normal to sweat over these kinds of common work situations. After all, no one wants to be a failure or be perceived as a dumb-dumb. But while the average worry-wart spends about 55 minutes sweating over such scenarios, those with anxiety spend almost five times the amount, or over 300 minutes in a single day, worrying about the same exact issue. 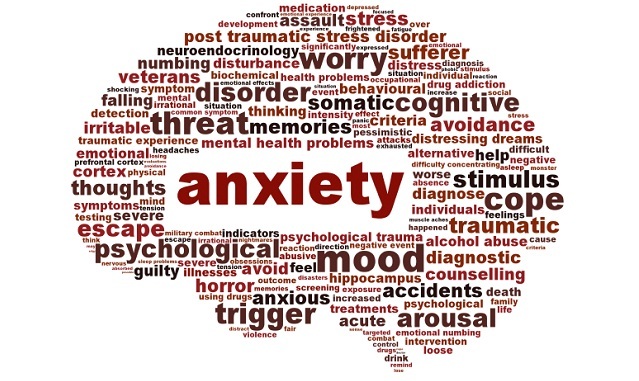 Anxiety is when you feel an overwhelming sense of worry or experience nervous behavior or internal unrest to a degree that it affects your everyday activities. It could be stage fright. Or perhaps you feel like all eyes are on you when you’re in a room. Suddenly you feel nervous. You can barely concentrate on your surroundings and in your mind you’re constantly berating your every action, your every word. Anxiety is painful, yet many people who have these feelings of constant doubt, internal uncertainty and overwhelming anxiousness in seemingly simple situations don’t even realize what they’re suffering through. The worst part about anxiety is that it affects your everyday life. You dwell on your problems and fears to the point where you can’t lead a normal life and move beyond what’s consuming your thoughts. People who have this disorder may feel like their life comes to a standstill anytime they’re faced with something that causes them this kind of extreme discomfort. Anxiety disorder is a form of mental disease, so the cure for it is much like how other mental illnesses like depression are treated—with medication and psychotherapy. Going back to the story of my grandmother, we know she was suffering through anxiety and she took regular medications for it. But the one day she ran out of her dosage or forgot to take it was hell to pay in our home. She would go nuts and drive everyone around her nuts, to the point that my father would go berserk and lash out at everyone around him. Not fun times for sure. But the bottom line is, if you decide to go the medication route, remember that every medication has its side effects and can cause dependencies. So if you don’t take your medication or happen to skip a dose, it’s likely you’ll feel a significant change within yourself. If you’re looking for a more natural route, some specialists might recommend remedies like yoga and acupuncture. Whatever you decide, make sure you do your research and consult with a specialist first. However, the most important thing you can do—and the most crucial step—is recognizing that anxiety disorders are a true illness and should be treated with as much care and attention as any other.